I’m experimenting madly here, and you’re my guinea pigs. Creativity is a lot like muscle tissue — if you keep exercising it, it gets stronger. There’s grounds to argue that writing full time keeps the creativity muscle plenty healthy, but for a long time now, I’ve been writing in the same six or so series. Breaking out and doing something completely different would disappoint everyone who loves Veris, Brody, Nial, Sebastian, Nick and Damian, Alex…. Well, you get the idea. So I thought I’d stretch my creative muscle here, in public, in flash fiction snippets. If you’re going “huh?”, then stay with me a moment longer. You’ve probably done exercises like this before. There’s a site online, called the Creativity Portal, and they provide a daily “thought prompt”, which anyone can use in any way. If you like journalling, then you could use the same prompt to generate your thoughts in a journal entry, for example. I thought I’d use the prompt to see what story ideas percolate upwards. 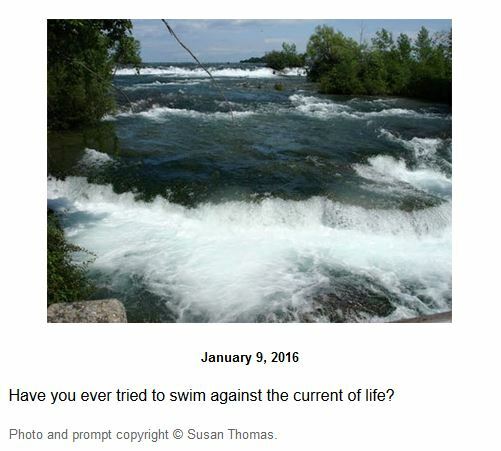 On the left is the January 9th prompt, which happens to be the day I’m writing this post. There’s three objects in the picture, which might be people in canoes — which would be the easy answer. And that reminds me a lot of Last of the Mohicans, which is a fantastic romance movie, but let’s move away from the cliche. Because the picture isn’t big enough to figure out exactly what the three objects are, what else could they be? If I was writing SFR, I could say they’re automated sentries guarding the border of an advanced civilization. The heroine has to slide past them — and move upstream, too — in order to achieve her mission objective. It’s broad daylight, but there’s clouds on the horizon. Perhaps a super storm is moving into the area, which limits her time to complete the mission. There’s a man she has to rescue from inside the territory she’s breaking into, and she doesn’t know it yet, but it’s the man she loves, who has been missing for a year. All she knows is that if she fails this mission, she’ll be relegated to the colonial corps for ground-breaking duty on the outer rim of the known galaxy…. But I keep looking at the white water at the front of the picture, and the rock in the far bottom left corner. Does the water wash up against a cliff there? Whoever took the photo had to be standing on something, so a cliff or bank seems logical. But again…the water. It looks cold, with all that blue green in it. Perhaps it’s glacier melt. Perhaps the three people that have just navigated the first small rapids at the top of the picture are trying to navigate the river as quickly as possible because a glacier further up the river has dropped an ice sheet, and there is a flood of ice and water and debris heading down the river. That would make this an interesting romantic thriller. The heroine is in one canoe, the hero in the other…and a bad guy or gal in the third, pursuing them. Why? They’ve just retrieved the gold bullion he stole from a train…oh! So this could be an historical romantic thriller — old west period, and right out toward the far west coast where the big rivers run and glacier melt isn’t out of the question. What would become Washington state, or Oregon. The bullion the bad guy stole was intended to buy land for a dozen families who had spent a decade raising the cash. They have to get it back, and the land sale ends in three days. So what do you think? SFR or historical romantic thriller? Do either of them tickle your interest? Or does the picture suggest something else entirely to you? Add your thoughts in comments! Wow, as always I’m amazed at your imagination; I don’t think I could ever do that. But back to your question, although I’d love for it to be a sci-fi story I think within this picture I would go more towards the Historical Romance Thriller. Think I like your scenario on that better than the sci-fi one. Hope your New Year with family and friends was a good one. Say Hi to your Mom for me. Mum returns to Australia on Thursdasy, so we’re coming down to the wire, and squeezing in a lot of little “must do”s before she goes.